It’s easy for pro-gun folks like me to say gun control won’t work, but it’s better if the reasons why are provided. First, there’s the old adage that when guns are outlawed, only outlaws will have guns. It’s true because even if the government were to go as far as banning the manufacture of firearms, effectively shuttering the facilities of American manufacturers like Remington, Ruger and Smith & Wesson (just to name three well-known ones) and require all dealers to surrender their unsold inventory to the Bureau of Alcohol, Tobacco and Firearms so law-abiding United States citizens could no longer purchase additional guns, criminals would still be able to obtain them. How? By stealing yours and mine or by obtaining ones smuggled into the country. So yes, the outlaws would have guns. The second reason gun control won’t work revolves around the fact “street drugs” are not permitted in this country. How’s that working? Obviously, given the number of drug overdoses our medical centers are treating and the frequency of drug-related arrests reported in our news media, not at all. All banning guns will do is place another thug selling guns across the street from the one pushing recreational pharmaceuticals. Finally, a ban on guns will impact the personal safety of our children and grandchildren. They will be the ones who cannot buy guns, so since the outlaws will have guns as well as the knowledge their prospective victims will not, our kids and their kids will be easy targets. You’ve heard the old saying about taking a knife to a gun fight — well, our successors will be doing just that. I hope you noticed I haven’t even mentioned how such legislation would rob our children and their children of the enjoyment of hunting, target shooting and all the other shooting sports. Also, not to be overlooked is the fact qualified young people frequently receive full scholarships to colleges with shooting teams, something that obviously wouldn’t exist if there were no guns. This incident and the resulting renewed media push for gun control legislation will replicate the impact on firearm sales that the Obama elections did. All of the above will drive everybody and their dead aunt to buy all they can just because they may not be able to in the near future. The “get ’em while you can” mentality will set in again, putting even more of those “dreaded things” in the hands of Americans, effectively setting off a huge backfire of gun ban legislation. Our son is a good example of that. He is buying the parts and pieces to assemble an AR simply because he might not be able to buy that stuff sometime in the future. Rant over. I just wanted to get that off my chest. What is a release trigger? It simply is a trigger that is first set (pulled and held back) and then released when the gun is to be fired. That sounds horribly confusing as it is exactly backwards from what we consider “normal” operation, but it really is not all that challenging IF your mind is “right.” My first time using a release was about 25 years ago when I bought an engraved 1986-vintage Krieghoff KS-5 trap gun that came with a release hook (more on the parts involved later) already in place. Those old guns could be changed from a pull trigger to a release trigger by simply turning an Allen® screw in the trigger. A hole in the trigger guard was even provided so that could be easily accomplished along with adjusting the pull trigger weight via a second screw. Product litigation concerns in today’s legal climate have rendered such conveniences excessively risky, so external methods of changing triggers like that no longer exist. One night while shooting practice, I decided to give the release a try. After just five targets, I declared anyone would have to be nuts to use one. But it’s amazing what the mind can adapt to when it knows it must. When I started to flinch several years later, I had a 14 on my first trap with the release and a 24 on my second trap! Besides curing my flinch, the release also smoothed my mechanics. When you use one, you relax a muscle to fire the gun instead of tightening one, thus removing the inclination to stop the gun. Double guns can have one or both triggers work as releases. “Double release” is the term used to describe a gun with two release triggers, while release-pull is the most common setup if just one trigger is a release. Some super-serious doubles shooters use release-pull even though they do not use release triggers for any other shotgun discipline because it is faster than pull-pull. With that latter setup, the shooter must pull and release the first trigger then pull the second one. Release-pull requires just those two movements after the first trigger is set. “Sears” in a gun have no relation to the department store of the same name. They are the surfaces used to control the action of the trigger with regard to making the gun fire. When a firearm is cocked, two surfaces come into contact with one another with the trigger sear bearing against the firing pin or hammer sear. When you apply pressure to the trigger, sear pressure is relaxed, allowing the pin or hammer sear to disengage from the trigger sear and the pin or hammer to travel towards the primer. 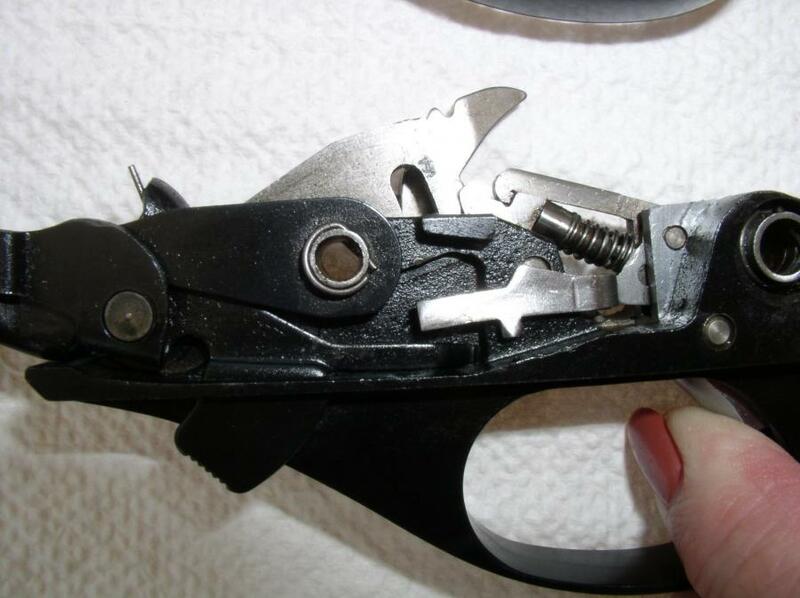 Converting a shotgun trigger to release requires the installation of a “hook” with a second sear that “catches” the hammer or firing pin after the first sear releases it, and holds it until the trigger is released. The photos of a Remington 870 trigger group that have been converted to release hopefully are the pictures that speak a thousand words. One photo shows the trigger cocked and the other, the one with my wife holding the trigger back (or set), shows the trigger group after the trigger has been pulled and is being held back prior to being released. The amount of sear engagement determines how fast the release(s) will be. That speed refers to the amount the finger pressure on the trigger must be released before the hammer or firing pin is allowed to go on its way. Stoning or filing those sears will change the speed of the release(s), and shooters have different preferences for that speed. I prefer a fast but not lightning-quick release and honestly feel anyone who can handle a slow release probably doesn’t need a release trigger in the first place. There probably is a visual reason for their flinch that can be addressed via shooter mechanics rather than trigger mechanics. Having a trigger converted to release isn’t inexpensive, as most good trigger specialists charge about $250 and up for one trigger in a break-open gun. That may sound excessive but, remember, if something happens to cause that trigger to allow an unwanted discharge, that gunsmith could wind up as a defendant in a lawsuit. And, there can be a drawback to having a gun’s trigger(s) converted. Its resale value could be reduced unless you happen to luck into a buyer who would be having the gun converted if it wasn’t already. Otherwise, you can wind up with an expensive restoration job. Been there, done that. Many years ago, I passed the Krieghoff Model 32 top single combo with which I enjoyed my most trapshooting success along to son Jason who at that time used pull triggers (and still does). 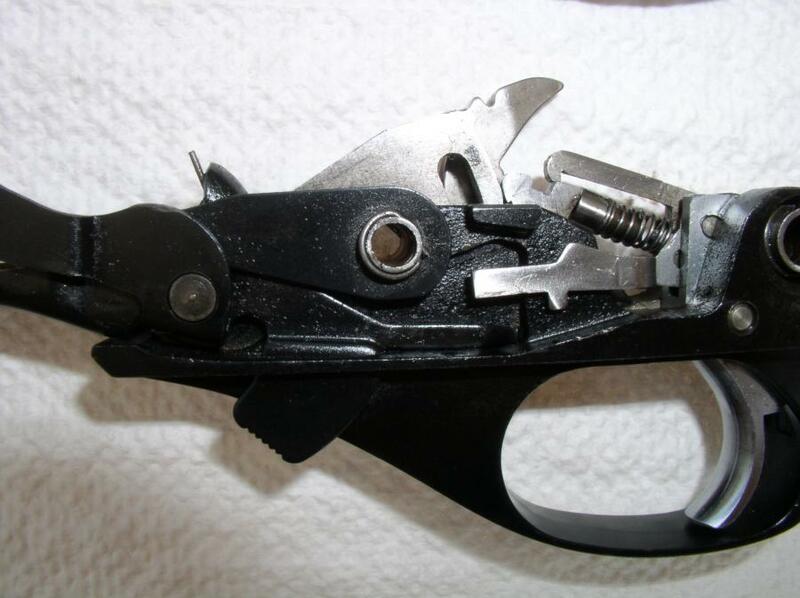 Because of how the trigger and hammer sears were reshaped to function with the release hooks, the resulting pull triggers were horrible and borderline unsafe. That was not the fault of sloppy gunsmithing, as that conversion to double releases was performed by a former Krieghoff International gunsmith. It is just a potential result of that conversion, especially if faster releases are desired. In order to restore the gun to good pull triggers, the hammers had to be replaced and the trigger group rebuilt. The total job, with parts, exceeded a thousand dollars and that was with me being extended a discount on the work. In fairness, Krieghoff parts aren’t cheap but regardless of the brand of the gun, the job isn’t one paid for with pocket change. So consider everything before pulling the trigger (pun intended) on a release conversion. I’ve mentioned this several times in the past but one thing you absolutely MUST try if you start flinching is lowering your gun holdpoint because many flinches, especially those that occur with release triggers, are caused by a visual disconnect with the target. Holding lower allows your brain more time to establish that connection, without which it resists giving the “fire” command to your finger. 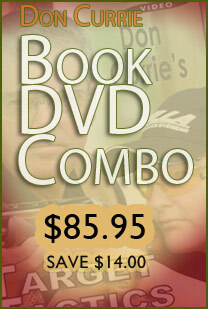 A release trigger can be a shooting career extender, as it was for me. Always make sure you really need one first. Jim Kester, the president of the Library Sportsman’s Association near Pittsburgh, thanked me for the column on New York targets. His club had just received a supply of them, and he was anxious to shoot at some. Greg Nagurney asked for some help with powder selection for 16-gauge reloading. I was unable to offer much in the way of help but did allow a slower powder than customarily used in 12-gauge shells might be in order, as I used slower powders when I reloaded for Jason when he starting shooting at age nine with a 20 gauge. Greg Gerou asked for advice on the purchase of a trap gun and specifically wanted information about the TriStar TT-15 DT. I told Greg while I have never shot one of those guns, the local gun shop I patronize sells them and I have handled a few. I think they are a lot of gun for the money. The biggest negative I could detect was you must possess the strength of the Incredible Hulk to open and close one until it “breaks in.” I put Greg in contact with that shop. Ed Clapper started shooting trap in 1974 but quit six months later due to limited ability and a sore jaw after every shoot. He tried again in 1989, but this time had friends who helped him overcome the obstacles. He liked the sport and became a student of it, attending several shooting clinics, some more than once. In 1989, he was automatically low man on the squad; in 1994, he broke his first 100-straight and won his first registered shooting trophy at the Carlisle, Pennsylvania, Fish & Game Association. His first 200-straight came in June, 2000, at Elysburg during the Pennsylvania State Shoot, where he came in third in a seven-man shoot off for the state championship, finishing as Class AA winner. He earned his 27-yard pin that July. Ed wrote for Trap & Field for many years and began writing for Shotgun Sports in 2002.